Let me start by saying that a good value proposition makes or breaks a product. Your value proposition is the #1 thing that determines whether people will continue reading through your website or leave it right away. From a marketing perspective, it’s the main thing you need to test to see if your product can drive sales. Just remember that your value proposition is not your tagline, and you need more than fancy marketing words to showcase your product in all its glory. A value proposition is a promise of value to be delivered. It’s the primary reason a prospect should buy your product. That being said, your proposition should be human-centered and understandable. Your proposition should be relevant to your audience, offer quantifiable value, and should have a differentiator that makes it stand out. Your value proposition should be the first thing your visitors see on your home page and all your major entry points and landing pages. You want people to actually read and understand what your website is all about. I do a simple exercise with my clients to help them create their value proposition on a single page. I ask them to explain their product to a friend – or to me – without using buzzwords or jargon. I also tell them to focus on the benefits and the problems it solves. The benefits come later; you need to capture your prospect’s attention before reeling them in. For the sake of this post, let’s say your product is a CRM. You did your research, and you know that while many companies need a CRM, many products also fail because of poor user adoption. And, you’re determined to change that. Let’s go through your value proposition together. These two pain points can help you craft your value proposition based on real problems. Simply put, a CRM helps you get things done. But, what are the benefits of your CRM? Maybe it reduces time-consuming data logging, enables you to calculate accurate quotes, or reminds you about meetings or activities. Whatever it does, it’s easy to understand and meaningfully helps your prospect. What value does your product add to the market? It may function the same as other products in the market, but there must be something that makes your product worthwhile. Maybe it’s outstanding customer service, or great product design. Or, perhaps it’s price. It’s whatever your customers find valuable. Keep your proposition in your customer’s language. Customers have conversations in their heads about their pain points and possible solutions. If you speak their language and insert yourself in the conversation, they will notice you and hear your proposition. Your product should be the solution they’ve been looking for all this time. Differentiation helps your product stand out and provide superior value to customers. In this case, your CRM needs both physical and perceived differences. The perceived differences can be acquired later through advertising, but the physical differences (performance, features, and efficacy) are where most of your B2B marketing efforts need to be. This post wouldn’t be complete without some examples from other SaaS B2B and B2C companies who have done a great job with their value propositions. These value propositions and catch phrases are short, memorable, and capture the overall value and ideas of their brand. Squarespace is one of the fastest growing ecommerce platforms and one of the most used, too. Let’s take a look at how Squarespace communicated their value proposition. At first glance, we clearly see what it does. The first few words highlight their positioning as the leader in website design. It also says that it helps brands to stand out online. And their main differentiator? The platform’s ability to help brands stand out online and cut through the sea of sameness. I'm also a fan of their new rebranding! 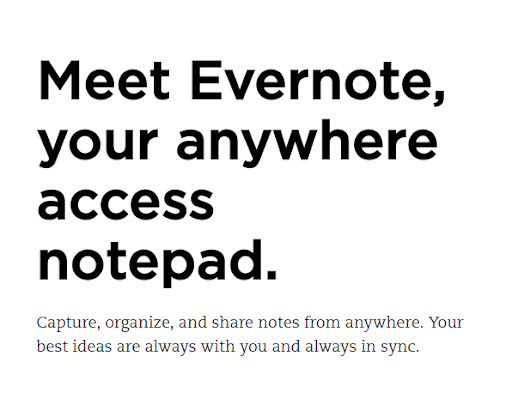 You’ve probably used Evernote or a similar note-keeping platform at some point. From the beginning, Evernote communicates to you its main differentiators: It’s easy to use, convenient to access, and easily syncs with whatever device you’re using. In 2019, the Evernote team have been working on refreshing their brand narrative and proposition. Below is the latest evolution helping people with effortless organisation. Certainly resonates in a world of technology and chaos. Hubspot’s value proposition is pretty self-evident. It helps your company “grow”, which despite being a buzzword, is quantifiable. They do this by helping you build deeper relationships with your customers throughout their life cycle, thus keeping them happy and nurtured. The latest evolution in their "growth" story is helping to position Hubspot as a better way to grow. Similarly, Hubspot works on a freemium model AND it’s scalable. It lets clients use it for free before having to buy it, which is one of its main differentiators besides its powerful features. In their value proposition, Airbnb takes a more human, emotional approach, mainly because it’s a B2C service that requires human interaction to thrive. It provides travellers with easy access to unique rooms, flats, or houses around the world. Also, their main differentiator is they offer people the chance for unique experiences. The added bonus is that the positioning also emotionally appeals to people looking to rent out their home. Slack can be seen as yet another team messaging app, but in truth, it is much more than that. To me, slack is about productivity to move work forward. If you see their value proposition, Slack services teams and breaks down the communication silos between them. It aims to become more than a simple team chat app, and I believe that’s something you can see in their value proposition. This is what makes them different to the other team messaging alternatives out there. If you’ve used a meeting platform, you know that sometimes the video and audio quality can be pretty awful. Zoom’s value proposition addresses these concerns and offers a tool that bridges these gaps. It offers flawless audio, clear video, and the possibility of instantly sharing your meeting space with unparalleled ease. And, because Zoom’s value proposition is so straightforward, it’s easy to see how it can help your business better than other meeting platforms on the market. In fact, they’ve focused their entire value proposition on differentiating themselves from the competition. Spotify is another example of a great value proposition. It’s free, it offers 12+ millions of songs, and you can use it from almost any device. From that perspective, Spotify’s central value proposition is its convenience. I like how they have evolved their premium offer to be focused around happiness. It resembles a modern day, relevant can of coke without the sugar. Last, but not least, your value proposition is the core of your competitive advantage. It articulates what your business is all about and why someone would choose your service over a competitor’s. Remember that your value proposition is not a slogan. Your value proposition needs to set you apart from your competition, and your customers won’t really choose your product over another based only on a high-level mission statement or a witty tagline. Cat is a Hubspot agency partner and a paying customer of Zoom, Hubspot, Squarespace and Spotify. She's also a slack groupie and an Evernote hoarder.